These were SOOOOO good. Christian could not stop "mmmmmm"-ing the whole dinner. Like, I am craving these again right now. They were easy and kid-friendly, but still totally impressive. Note: Reduce the chipotle chiles to one teaspoon if you want to eliminate some of the spiciness. In a pinch, you could sub 1-2 teaspoons chili powder for the chipotle chiles but the flavor won’t be quite the same. Increase the heat to medium-high and cook the mixture left in the skillet until the liquid is reduced to about 1/4 cup, about 5 minutes. Off the heat, whisk in the yellow mustard. Using 2 forks, shred the chicken into bite-sized pieces and return to the skillet. Add the remaining cilantro to the skillet and toss until well combined. Season with salt and pepper. 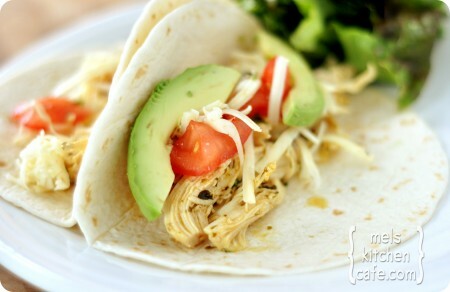 Serve warm with tortillas topped with lettuce, cheese, tomato, sour cream and avocado. To warm the tortillas, wrap them in foil and heat in a 350-degree oven for 15 minutes.